A few months ago, Pokemon Go revealed it had added Shiny Pokemon to the game during its popular Water Festival Event. Shiny Pokemon, which have alternate colorations than their non-shiny counterparts, are ultra-rare and highly prized among Pokemon fans. Although Pokemon Go has only added two Shiny Pokemon (Magikarp and Gyarados) to the game so far, fans have constantly searched for more signs that other Shiny Pokemon are on the way. A few weeks ago, a Pokemon Go fan site called PokemonGoHub.net spread a rumor that Shiny Bulbasaur were being added during the game's "Spring Bloom" mini-event. That rumor proved to be false, but many sites (ourselves included) bought into the Shiny Hype. Now a new hoax is spreading around the Internet involving a Shiny Pokemon in Pokemon Go. 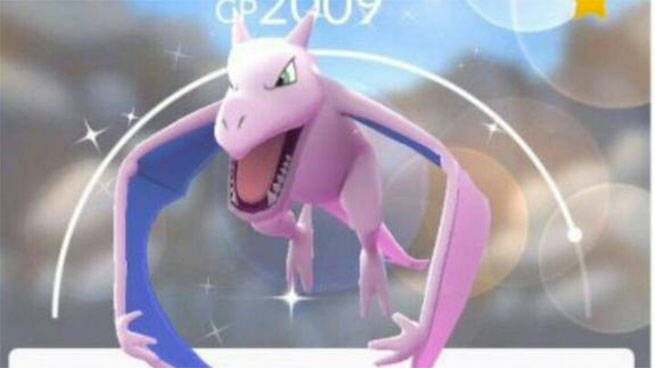 Shortly after Pokemon Go's new Adventure Week began, a screenshot hit the Internet showing a Shiny Aerodactyl. The screenshot has spread to numerous Pokemon Go Facebook groups and fan forums and was even the focus of several YouTube videos. You can check out the screenshot in the photo gallery above. Sadly, the screenshot is a pretty obvious Photoshop and there's no evidence that Shiny Aerodactyl was actually added to Pokemon Go. The biggest clue is that no one has provided any proof that they've caught a Shiny Aerodactyl outside this one screenshot. For comparison, dozens of players posted pictures that they had caught a Shiny Magikarp minutes after it was added to Pokemon Go. Luckily, Pokemon Go's Adventure Week has plenty of other cool features, so fans should still enjoy this weekend's event even if it doesn't have any Shiny Pokemon. Stay tuned to WWG for more news about this weekend's Pokemon Go event.